Information About The Brampton Area - GoWest Realty Ltd. If you have any questions or would like more information about Brampton, Ontario please Contact Us. If you are planning on buying your next dream home visit our Buyers Page. If you are planning on selling your home visit our Sellers Page. 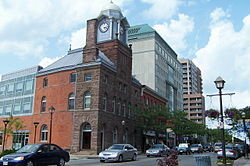 Brampton is the third-largest city in the Greater Toronto Area (GTA) of Ontario, Canada and the seat of Peel Region. As of the 2011 census, Brampton's population was 523,911 making it the ninth largest city in Canada. With the median age at 33.7, it is the youngest community in the GTA. Brampton has the largest concentration of South Asians in Canada, making up 31.7% of Brampton's population. Brampton was incorporated as a village in 1853, taking its name from the rural town of Brampton, in Cumbria, England. Brampton was once known as The Flower Town of Canada, a title it earned due to the city's large greenhouse industry. This included Dale's Flowers, a company that won many international rose awards for nearly half a century. Today, the city's major economic sectors include advanced manufacturing, retail administration and logistics, information and communication technologies, food and beverage, life sciences and business services. Find a Home in Brampton today! In early 2006, the Brampton campus of the William Osler Health Centre was renamed Peel Memorial Hospital. It was no longer considered a part of the William Osler family of hospitals. On October 28, 2007, Brampton Civic Hospital opened its doors while Peel Memorial Hospital closed for renovations. Since then, the fate of Peel Memorial has been the subject of controversy. Local residents want the hospital to re-open as an acute-care facility with an emergency department, arguing Brampton Civic Hospital's 479 beds are not sufficient to meet the needs of the fast-growing community. In September of that year, the Rose Theatre opened its doors in downtown Brampton. By 2008, the facility had attracted over 137,000 patrons, surpassing its five-year goal in its first season. The theatre is also seen as a catalyst for downtown revitalization. Since its opening, new businesses have opened, established businesses have renovated their storefronts and several high-rise condominium projects are either under construction or in the planning phases. In December 2007, the Toronto Star published an article entitled, "Brampton comes alive," which documents the latest in the city's revitalization plans and progress. In February 2008, the Central West Local Health Integration Network recommended that Peel Memorial be redeveloped to house outpatient services. That would include mental health services, cancer screening, day surgery and non-urgent care. Generally speaking, Toronto has spawned growth in all its neighbouring bedroom communities (Pickering, Ajax, Whitby and Oshawa to the east, Markham, Richmond Hill and Vaughan to the north, and Brampton and Mississauga to the west) since the early 1980s, due to a number of converging factors including an exponential rise in the cost of real estate within the city and high property and corporate taxes. Due to Toronto's high cultural diversity, jobs, and infrastructure (including public transit), it is a leading destination for immigration, which continues to drive demand for living space, thus buoying the real estate market. Brampton, with its proximity to the Pearson International Airport and road infrastructure, population growth, cost of land, and more favourable corporate tax structure, has become a prime location for corporate head offices, factories, warehouses, etc., as well as the typical domestic goods and services required to provide for the population. The 2006 census found that English was spoken as mother tongue by 44.8% of the population. The next most common language was Punjabi, spoken by 27.4% of the population, followed by Gujarati and Urdu at 2.8% each, and Spanish and Italian at 2.1% each. Companies with headquarters in Brampton include Loblaw Companies Ltd. Its current largest employers are Rogers Communications Inc., Chrysler Canada Brampton Assembly Plant, Loblaw Companies Ltd., Maple Lodge Farms, Canadian Tire Corp, Zellers (offices and distribution), Coca-Cola Bottling Company Ltd., Gamma-Dynacare Medical Laboratories, and Olymel L.P.. Loblaws, Maple Lodge and Zellers presence in the city includes their Canadian head office, national headquarters in the city include Bacardi, Brita, and Clorox. The city is home to Canadian Forces Army Reserve unit The Lorne Scots (Peel, Dufferin and Halton Regiment). Major companies in Brampton include: IKO Industries, Best Buy (and Future Shop), Brafasco, The Clorox Company, Ford, Rogers Communications, Nortel, Para Paints, Coca Cola Bottling Co., Nestlé, Chrysler Canada Ltd., Maple Lodge Farms, Sofina Foods Inc, Hudson's Bay Company (HBC), Frito Lay Canada, MD Robotics, Parkinson Coach Line and Canadian Tire. An automobile manufacturing facility was opened by American Motors (AMC) in 1960 as the Brampton Assembly Plant. In 1986, AMC developed a new, state-of-the-art operation at another location and called it "Bramalea Assembly". After AMC was acquired by Chrysler in 1987, AMC's Canadian division and its plants in the area (Brampton and Bramalea) were absorbed with the older facility closing in 1992. The newest factory was renamed Brampton Assembly and it became one of Brampton's largest employers with over 4,200 workers when running at capacity. Brampton's only public higher education institution is Sheridan College, which also has a campus in Oakville. Founded in 1967, the local campus focuses on business training, compared to its Oakville branch, which is the second largest school of Art and Design in North America. In Brampton there are two main school boards. One is the Peel District School Board, which operates secular Anglophone public schools, and the other is Dufferin-Peel Catholic District School Board, which operates Catholic Anglophone public schools. Under the Peel District School Board, the secondary schools are Bramalea, Brampton Centennial, Central Peel, Chinguacousy, Fletcher's Meadow, Harold M. Brathwaite, Heart Lake, Louise Arbour, Mayfield, North Park, North Peel, Sandalwood Heights, and Turner Fenton Secondary Schools. There are also 85 elementary and middle schools that feed these high schools in the city. Under the Dufferin-Peel Catholic District School Board, the secondary schools are Cardinal Leger, Holy Name of Mary, Notre Dame, St. Augustine, St. Edmund Campion, St. Roch, St. Marguerite d'Youville, St. Thomas Aquinas, and Cardinal Ambrozic secondary schools. There are 44 elementary and middle schools that feed these high schools in the city. The Conseil scolaire Viamonde operates secular Francophone schools serving the area. The Conseil scolaire de district catholique Centre-Sud operates Catholic Francophone schools serving the area. The Rose Theatre Fountain Stage Brampton's Garden Square, facing Main St. North The Rose Theatre along with Main St. and Queen St. There are several cultural entities in the city under the umbrella of the Brampton Arts Council. These include Visual Arts Brampton, the Brampton Historical Society and the Brampton Symphony Orchestra. Also in the city is the Peel Heritage Complex, which is run by the Region of Peel. The Rose Theatre (originally the Brampton Performing Arts Centre), billed as "a cultural and tourist destination that will attract significant new business to surrounding restaurants, shops and services", opened in September 2006. The City says that the facilities are expected to generate $2.7 million in economic activity the first year and grow to $19.8 million by the fifth year. Despite some cynicism, the Rose Theatre attracted over 137,000 patrons in its inaugural year, surpassing its original five-year goal. Since then, numerous new businesses have opened in the vicinity of the theatre and it's Garden Square, where a new Fountain Stage was unveiled in June 2008. Brampton has six libraries to serve its half-million residents. At one library per over 80,000 residents, it is the lowest library ratio among major Canadian cities. The City of Brampton's long-standing heritage conservation program was recognized with the 2011 Lieutenant Governor's Ontario Heritage Award for Community Leadership through the Ontario Heritage Trust. In 2010 the City received an 'honourable mention' under the same provincial awards program. Major shopping areas include Bramalea City Centre, Shoppers World, and "big box centre" Trinity Common Mall. The downtown area has some retail, the Centennial Mall and the Brampton Mall are also of note.